Halibut is my absolute favorite fish to barbecue. When grilled perfectly, it is a moist white fish that flakes off easily and melts in your mouth with every bite. I prefer the filets to the steaks just because there are fewer bones in the filet. Halibut is also fairly expensive at over $25 per lbs in our local supermarket, and it's one of the more challenging types of fish to cook perfectly. The most common mistake when grilling it is to overcook it. This creates a dried out mess. 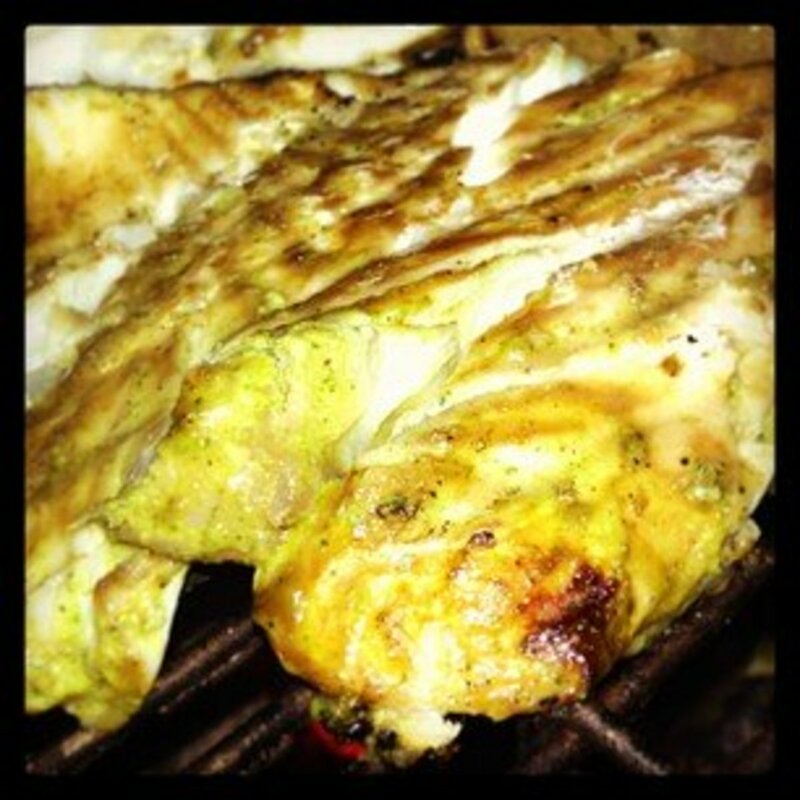 In this article, I want to help teach you how to barbecue halibut to perfection. The first step to delicious halibut is deciding on a seasoning recipe. Like most types of premium meats, there are simple rubs to complex marinades. I'll share two recipes we frequently use as examples. 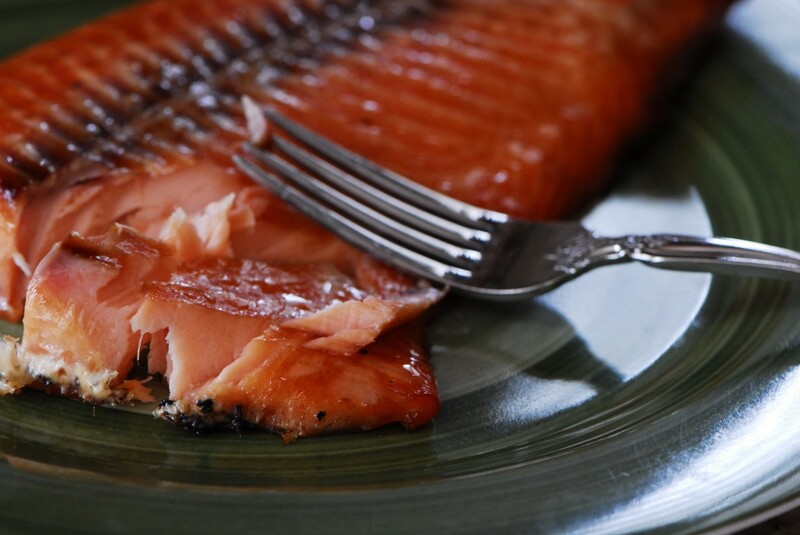 Let the fish sit for 30 minutes to 1 hour in a food safe dish. Add a lemon slice for a garnish. Follow the instructions below for barbecuing directions. If you're feeling more adventurous, this recipe offers a strong garlic taste, with fresh herbs and a hint of asian flavors when grilled. I modified this recipe from Steven Raichlen's How to Grill book. 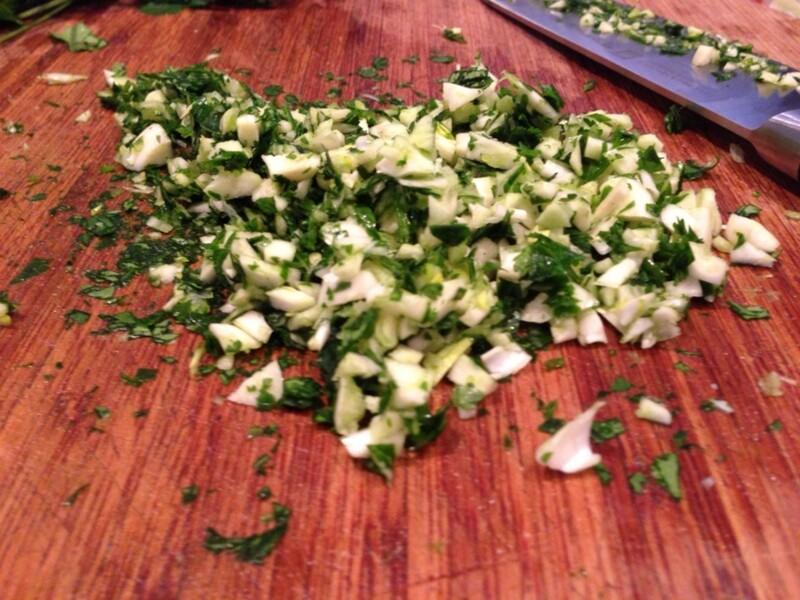 Chop the herbs and garlic up into small pieces. 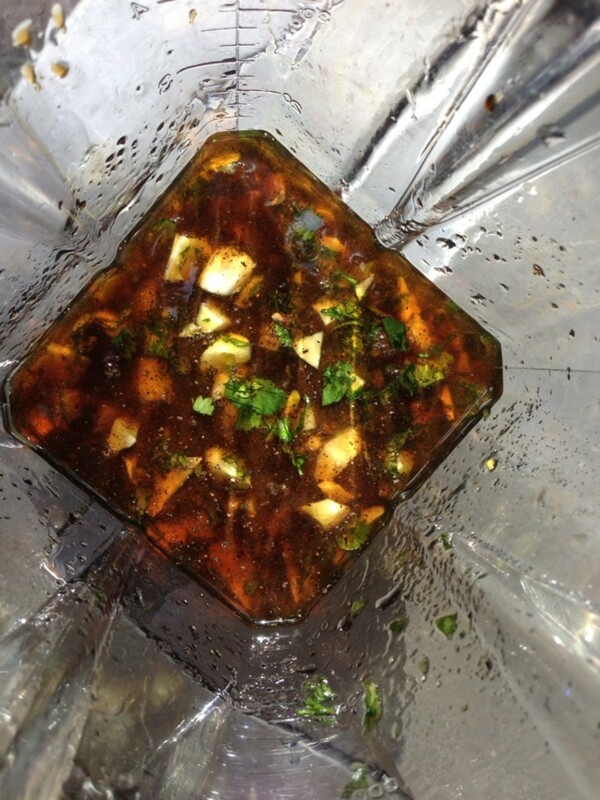 Then add all the ingredients to a blender or small food processor and puree into a nice green paste. 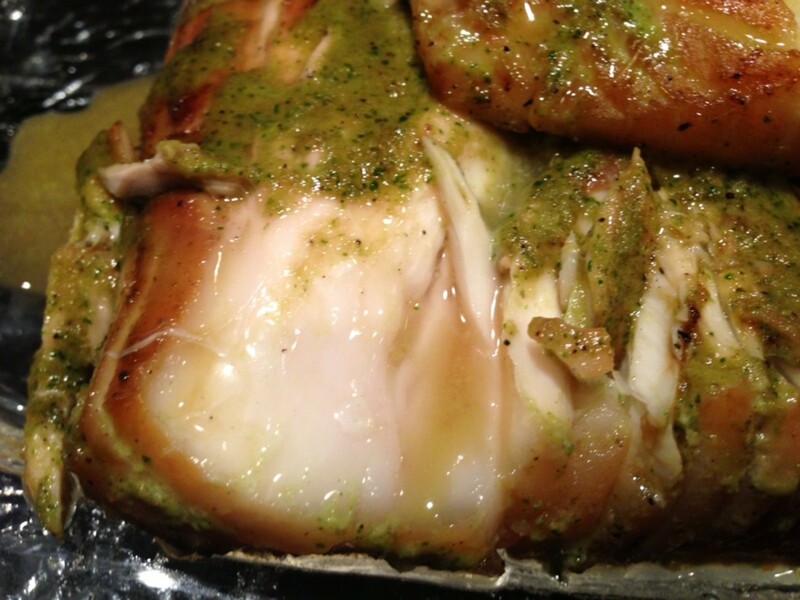 Let the halibut marinade in a food safe dish for about one hour. I prefer to let it marinade sitting out at room temperature. 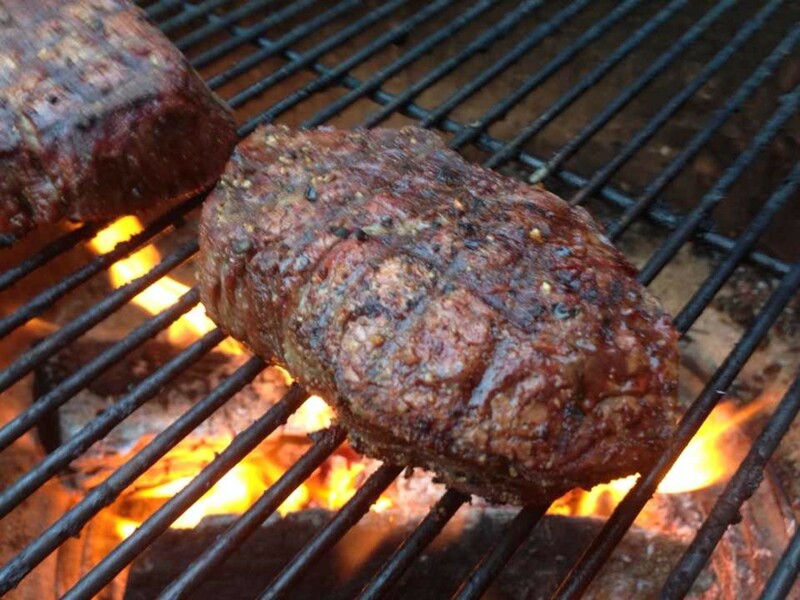 Try to flip the filets after the first thirty minutes so both sides fully absorb the marinade. In a short period of time, halibut will absorb a ton of the flavors. Save a bit of the marinade to drizzle over the fish while it's on the barbecue. Barbecue halibut using direct heat and a hot grill. On a gas grill aim for 400 degrees. On an open pit grill perform a hand test. If you can hold your hand for more than three seconds over the fire at grill level, the fire isn't hot enough. Halibut cooks very quickly. To make sure it doesn't dry out or over cook, the grill should be left uncovered during the entire cook. When the grill is hot enough, spray the grill or Pam or brush it with olive oil. This will prevent the fish from sticking to the grill. 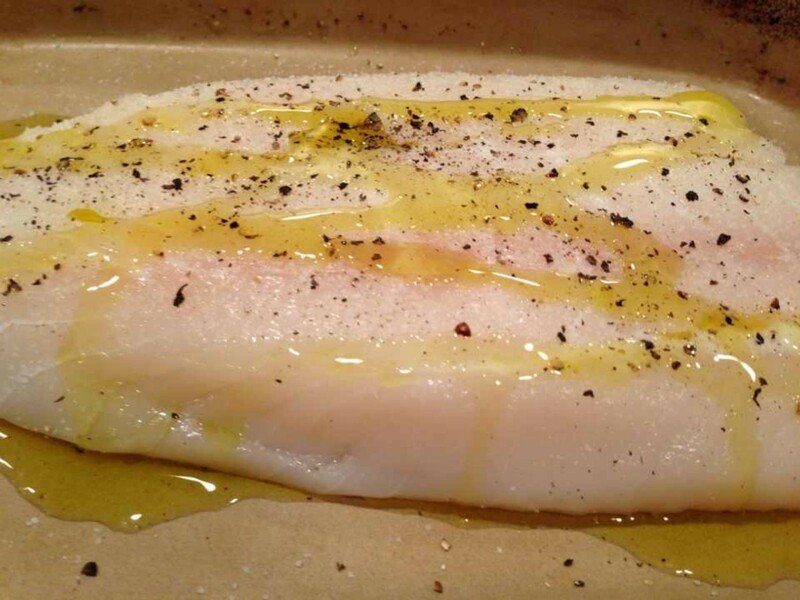 Cooking times vary based on the thickness of the halibut and if the meat is at room temperature before grilling. Almost all filets of this fish are between a 1/2 inch and 1 inch thick. Halibut should only be barbecued if it is at room temperature. 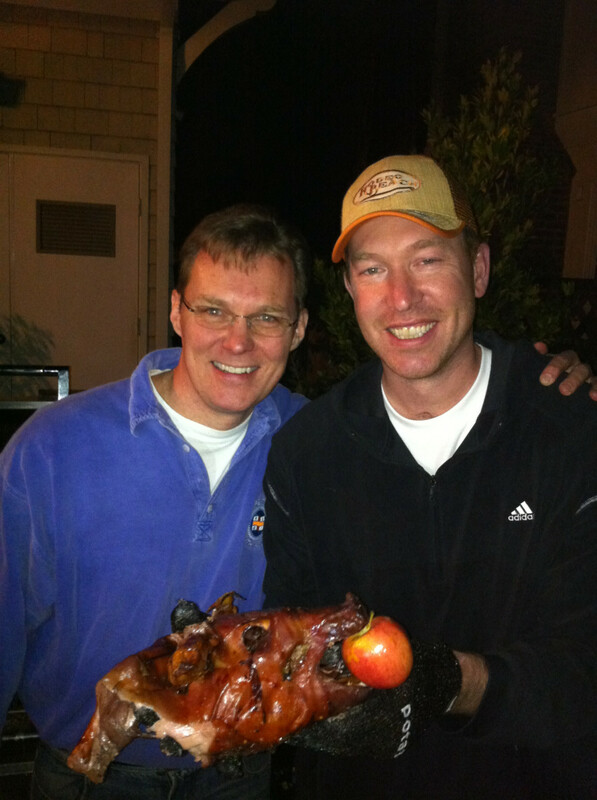 It should be sitting out resting for at least one hour before barbecuing to get to room temperature. 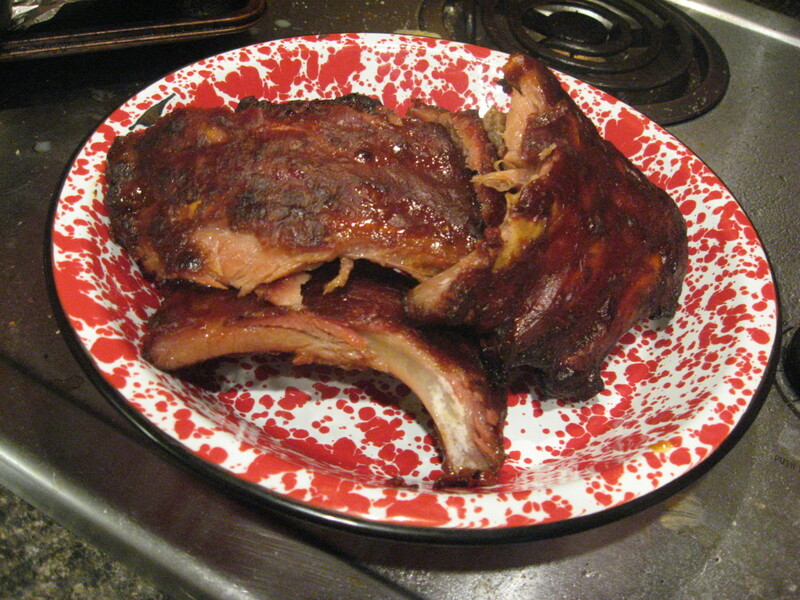 For pieces that are 1 inch thick, barbecue them for 5 minutes per side. 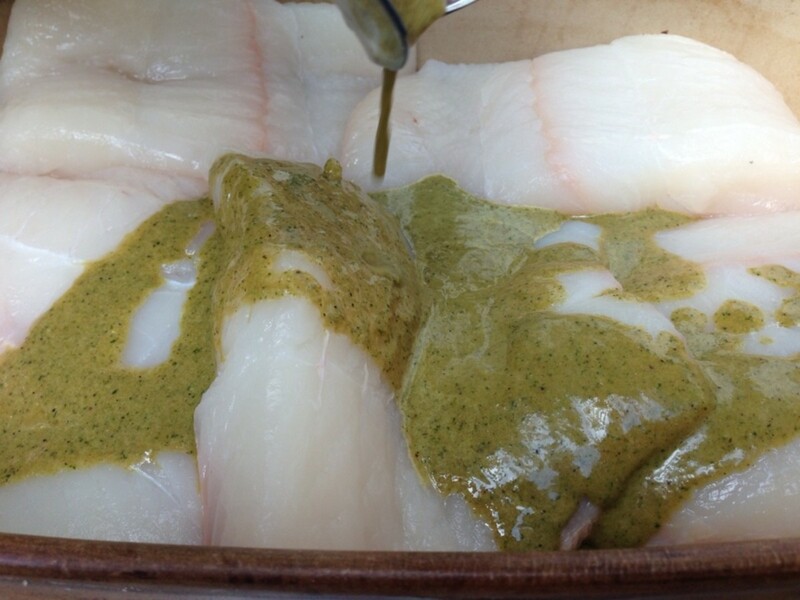 Almost all halibut filets will be finished cooking between 4 and 6 minutes a side. Be very careful to not leave the meat on the grill to long. 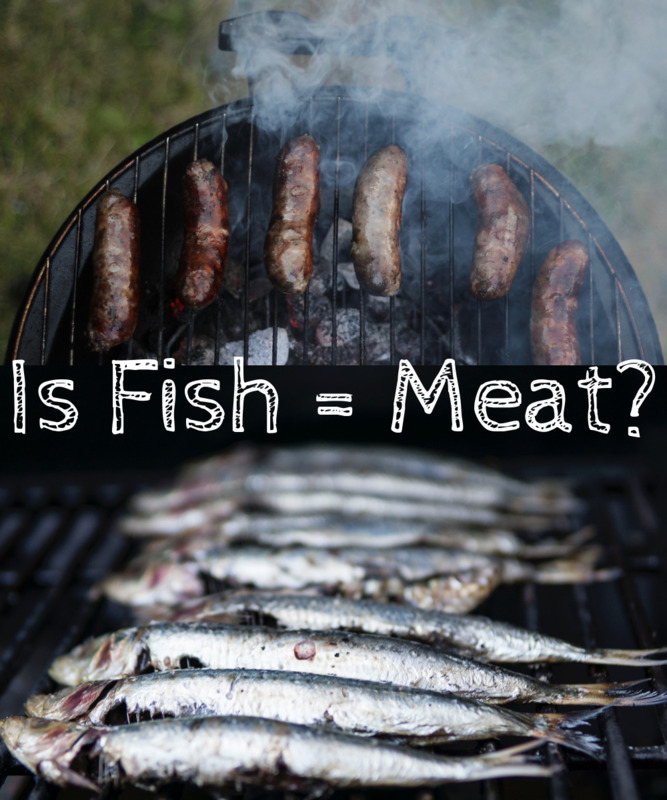 This is where most people that are unfamiliar with this fish make a critical mistake by leaving it on the grill too long. It should be noted that as halibut cooks it becomes flakey and can begin to fall apart. Use a fish spatula to flip the fish. Also, it's difficult to get pretty grill marks or cross hatches on halibut since it's only barbecued once per side. If you want to make pretty sear marks, you can try rotating the fish 90 degrees at the the 2.5 minute mark. It looks a bit prettier this way, but it won't change the way it tastes. First, the photo above shows exactly what perfectly cooked halibut should look like. It's cooked all the way through, but it still has plenty of juice. It should be moist. If it's not moist, it was over cooked. Also remember that once fish is pulled from the grill it will continue to cook. 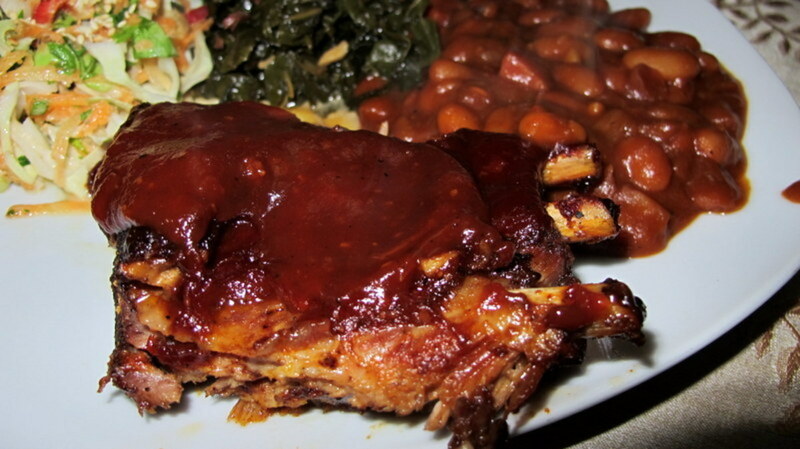 The picture above is about five minutes after it was pulled from the grill and it's ready to plate. The first technique to check if it's is done is by using a fork while it's on the grill. Halibut that is undercooked will look fleshy and opaque. Insert a fork into a thick portion of the meat and gently pull. If it's near done it will easily separate. Look inside and see if the juices are clear and if it has less than a quarter of an inch that is slightly underdone. Remember it keeps cooking when it's pulled from the grill. The second technique to make sure the halibut is fully cooked is to separate it with a knife and fork just before plating the food. At this point it should still be hot, and it should look like the picture above - Juicy and white all the way through. When you take your first bite you will know if you cooked it perfectly. If you followed the directions in this Hub your halibut will be barbecued near perfection. Your delicious white fish is all cooked, and you're likely on your way to being an expert halibut cooker. Enjoy your tasty victory. Barbecue halibut is a little different than other great barbecue meals like beef brisket because rice goes well with it. 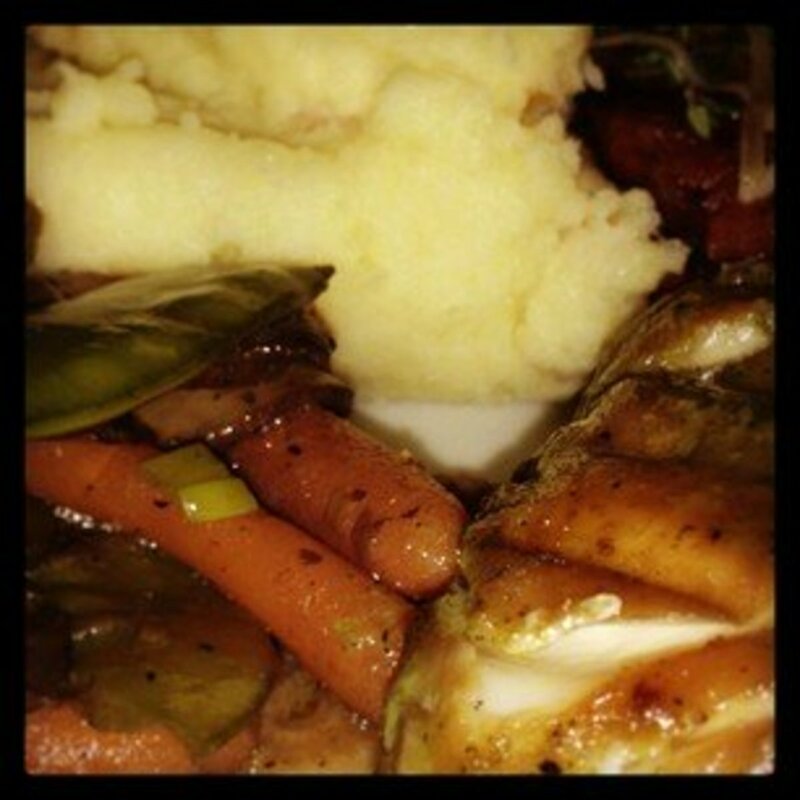 However, my favorite dishes to go with his fish are mashed potatoes or corn on the cob for the starch. I also like a salad or mixed vegetables as a side dish. Fresh French bread with butter is the perfect touch to bring it all together. 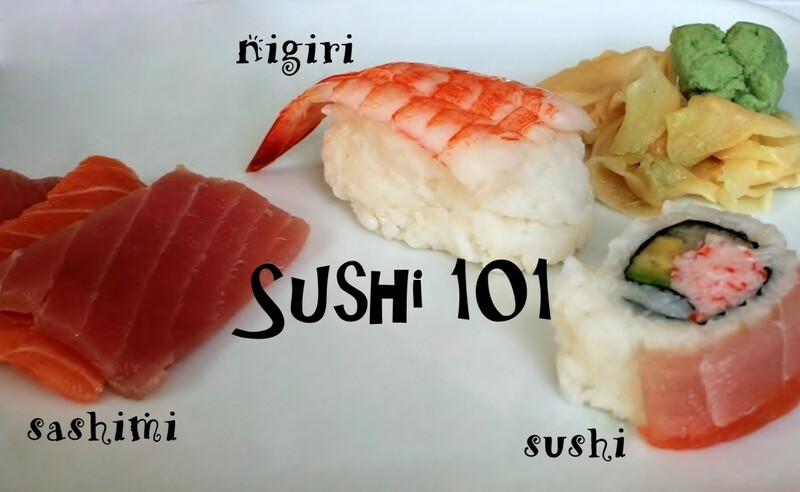 It's a simple but super delicious meal! I love both these ideas but as a self-confessed garlic-aholic, I am in no doubt which I prefer... I'm ashamed to admit that in nearly forty years of sea fishing - since earliest childhood - I have never caught nor tasted halibut. I remember once trying to order it from a local fishmonger but they wouldn't entertain me - even when I offered to pay in advance. They said they wouldn't sell it in bulk and couldn't take individual orders for the market. I am putting a note in my fishing diary to remind me that the next time I am at a coastal fish market and have cooking facilities, I'm going to buy halibut. Thanks for the nudge as well as the ideas. @vespawoolf I wish I could take pictures like you. This recipe makes my mouth water! 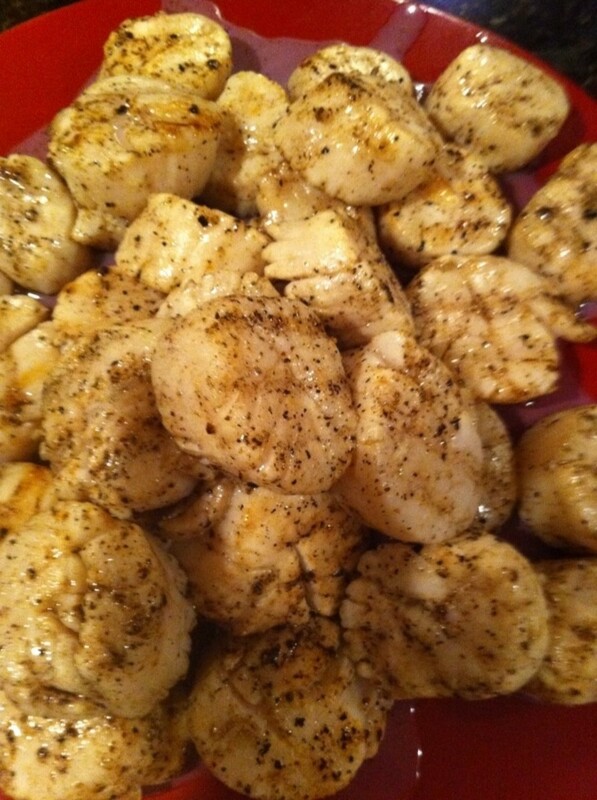 Lots of garlic and Asian flavors would pair well with Halibut, and I love blender sauces. So quick and easy. Can't wait to try this, Paul. Thanks!